How to rotate some entity model each time we press a key ? Also how is performance with visual scripting ? Lot behind Lua coding ? The only docs on it thus far is the one I started like ages ago but never got around to populating it.. This was a post from 2015..
3) micro graph containing a rotate module. 4) control just a cube! A simple scene script was then used to spawn the cube preset in an array of x=30 x z=30. So we had a screen full of 900 rotating cube and checked on the metrics, the results are as follows. So the new visual module system will give better performance than Lua and be more friendly to use. Still it is best to have developed systems in actions where can be. It does make a good argument for a Skyline SDK at some point. I am now wondering what the performance hit would be from c# mono, maybe something to check out at another time? So for most cases full game systems should be created dev side as actions, but where user customization is require the module system is the best bet. epsilonion wrote: The only docs on it thus far is the one I started like ages ago but never got around to populating it..
And good information about performance, it's nice to hear performance is better than Lua. 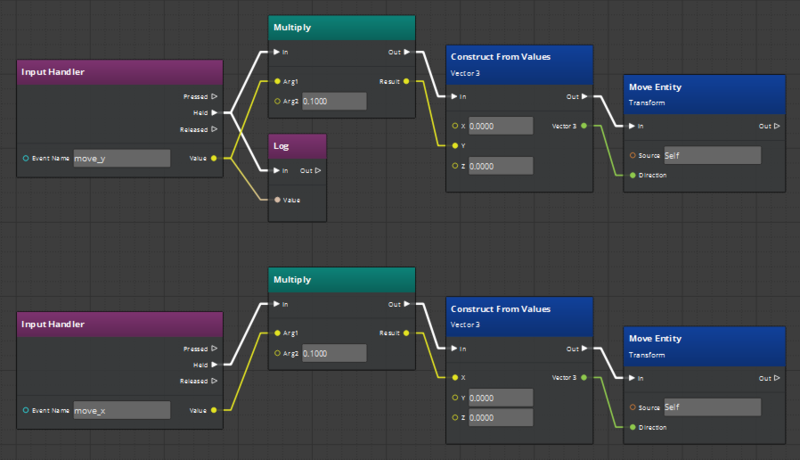 Major 3D engines proposes now Visual scripting that is a big benefit for level designers that does not code. It's great to have it in Skyline. I think we will need later some visual script examples instead of trying to learn from some "Fps armed character". The documentation is been rewritten by Starfire, I made a start on it to give new users a way to learn the many workflows within skyline but due to deaths in the family and personal money and health problems I couldn't keep on top of it. There will be more examples of the Visual system in time to come because it is a system that many people don't understand, much like UE4's plug in module system the system offers better performance as stated in the post above and dont forget if you require more modules you can always request them in the feature request section of the forum.